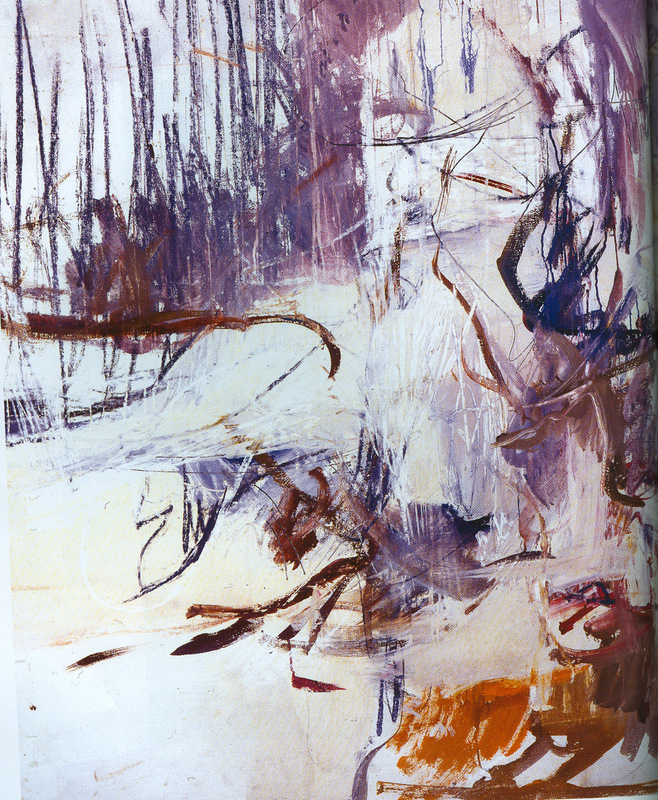 From 1974-77 Abbott taught at the Univ.of Minnesosta, her courses emphasized the use of color. When she returned to NY in the late 70’s she embarked on a series of flower paintings to increase her own understanding of color. Abbott continues to live in Manhatten and Southhampton, and continues to paint in the lively, energized manner of her earlier work . I invite you to enjoy the work of this remarkable artist who has remained largely unknown for the past 40 years. I am indebted for the images and much of the biographical information to the catalogues of the McCormick Gallery, written by Thomas McCormick. I’ve got news for you women who think that only women got overlooked by art history. A ton of men never got the ink either. There are a bunch of really deserving men who never got the notoriety of Joan Mitchell, Lee Krasner, Helen Frankenthaler, Grace Hartigan, Elaine de Kooning and others. Stop seeing sexism where it didn’t exist. The 50s art scene in New York was very egalitarian. Hi there, and greetings from Scotland! I’ve just stumbled upon this article by chance while researching AB-EX for the final year of an art course I am engaged in. I arrived here after initially looking at some work by Franz Kline and, in turn, to the “Suitcase Paintings: Smale Scale Abstract Expressionism” travelling exhibition organised by Georgia Museum of Art, which has a painting by Mary Abbott on the catalogue cover. Seeing both their work (Kline and Abbott) was a revelation to me, firstly, that not all AB-EX paintings were wall-sized, and secondly, there were actually many painted by women artists I had never heard of. I have a particular interest at this moment in getting to the essence of painting non-objective/non-figurative from the sub-conscious and it’s good to get some confirmation from others that this is indeed possible. Yes, Mary Abbott is a special artist. Another unknown AE artist is Rene Joseph (Minneapolis) who was a student of Mary’s at the University of MN. The website renejoseph.com shows some of her work, including a set of Southampton beach paintings created during a visit to Mary’s NY residences. I posted on Perle Fine in June (see archives). I am not familiar with the work of Yvonne Thomas. Thanks for pointing me in that direction. Thomas McCormick is a wealth of information relating to the Abstract Expressionist artists. His gallery has an exhibit called the Suitcase Exhibit traveling about the US right now that displays many of these wonderful artists. A couple of other women artists of this period that I would recommend looking into are: Yvonne Thomas and Perle Fine. I have had the opportunity these past couple of years to visit with Yvonne at her home in New York. Thomas was nearly forty years old and an accomplished painter when the 9th Street Show opened in 1951. Thomas had already abandoned a promising career as a commercial artist and fashion illustrator in the thirties to pursue painting. She has grown up in the south of France and had always known that she would be an artist. Her earliest training in New York was under Alphaeus P. Cole at Cooper Union. In 1948 Thomas began to feel frustration with the direction of her work and began to search for a new way of working. Then Patricia Matta, wife of the famous Surrealist, introduced her to a group of abstract painters forming a school called Subjects of the Artist. She enrolled, and found a new home meeting like-minded students such as Mary Abbott. When the Artist’s Club formed she also joined and then later worked with Hans Hoffman in Provincetown where she found the “courage of color.” She currently lives in New York City. Perle Fine was born in 1908 in Boston, MA and was one of the first women to be admitted to the Artist’s Club, which was no small feat considering the time. By 1949 she already had an enviable exhibition record which included solo outings at both Willard and Betty Parsons in New York and at San Francisco’s de Young Museum. In relation to her work, Fine considered herself as an interpreter of the psyche and her visions were reflected on canvas with a distinctive style and painterly technique. She studied first in her native Boston before enrolling in 1935 at the Art Students League. In 1939 she began working with Hans Hoffman, both in New York and at his summer school in Provincetown. In 1954 she moved with her husband, photographer and painter Maurice Berezov, to the Springs district of East Hampton. Fine remained active her entire life, teaching privately and at Cornell University and Hofstra University. She had more than thirty solo exhibitions and countless group showings and she is represented in numerous private and museum collections. She passed away in 1988 in East Hampton. Wonderfully!! I am backing into A E all over the place and have funneled this into some of my fiber work w/o even realizing this had a name- then my statement reflects the attitude. So I’m wondering – am I being influenced because A E is having a resurgence or am i finding it because it fits! Wonderful and informative – So glad to have read it- Thank you! I didn’t see your comment above until I finished today’s (Wednesday’s) post. I will definitely try to find the book. With reference to being a pupil of, or influenced by Hoffman, a book I read a little while ago was very interesting on Lee Krasner, and placed her in an American female context: Three Artists (Three Women): Modernism and the Art of Hesse, Krasner, and O’Keeffe (Ahmanson-Murphy Fine Arts Book) by Anne Middleton Wagner. As is the way of these things, it is so jam-packed with interesting content I really need to read it again. I’m also and definitively not an expert — just fascinated. I think Hoffman was a mentor to the entire crew of ab. exs, which is what made me think perhaps he and Abbott had some connection. But I know nothing specific. And definitely these pieces are totally out of imagination, not based on parsing pieces of a realistic vision. The teaching of abstraction is often based on abstracting from something — enlarging and cutting up until unrecognizable or having a shape of a real thing in mind when you start developing your canvas. There’s a huge difference between that and starting with only the canvas, the paint brush, and your own imagination. Here I speak from personal knowledge because I have only done one or two pieces that I would say were totally from my imagination and not begun with something from which I was abstracting. I see what you mean about Hoffman and Abbott, June, although nothing I have read suggets that she was ever a student of his. I don’t think he was even part of the Subjects of the Artist School (but I’m not an expert on this subject, just digesting my recent readings). But their paintings share a “landscape sensibility” (well, that’s what I’m calling it anyway). They seem truly abstract, rather than non-representational. What do you think? I’m beyond anger at the ignored talent of the female — I see it as a set of cultural stupidities whose slime we still have to deal with but which we’ve had some luck at scrubbing away. But at my advanced age, I find myself turning my back on the willed ignorance, having confronted it directly far too long. But to go back to our re-discovery — there is also something good about delayed gratification, not perhaps for the artist, but for the rest of us, who suddenly happen upon a whole world we didn’t know existed. We have been prepared for it by the male ab exs and so we recognize and enjoy even more when these women spring up for us. It looks to me (and I’m talking off the top of my head) that Abbott and Mitchell both are off-spring of Hans Hoffman. But someone like Bridget Riley (op artist) has a kinship with, it seems to me and without more than scant knowledge) Jackson Pollock. Maybe it’s just the dots. Like you, Clairan, I’m fascinated by the abstract expressionists. I want more, more, more. The movement gained notoriety because of a combination of the male chauvinism of the time, the American hegemony after WWII, and the flamboyance of the artists. And oh, yes, the art. Only the art continues to engage me in a positive manner. Abbott, I think, was definitely earlier than 2nd wave of the 50’s; she met up with the big guys in 1946 and started painting with them immediately. Some of her best paintings are from the late 40’s and early 50’s. 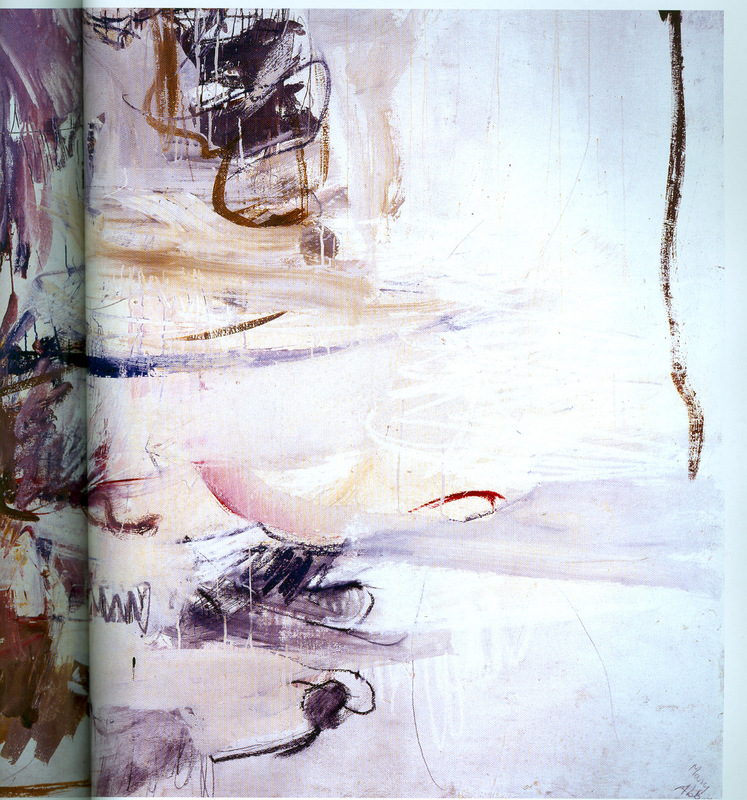 I will try to research Frankenthaler and Mitchell and Krasner. Or someone else can. . . . It is exciting, isn’t it, to find someone fabulous and new to you? But it makes me angry too to see ignored talent because it’s female. Not that the abstract work looks particularly female to me. Does it to anyone else? Like Olga, I don’t remember ever running into Mary Abbott, but her work is fascinating. How many other ab ex’s, particularly female, must be out there, hidden in the shadows by those enormous egos (mostly male)! 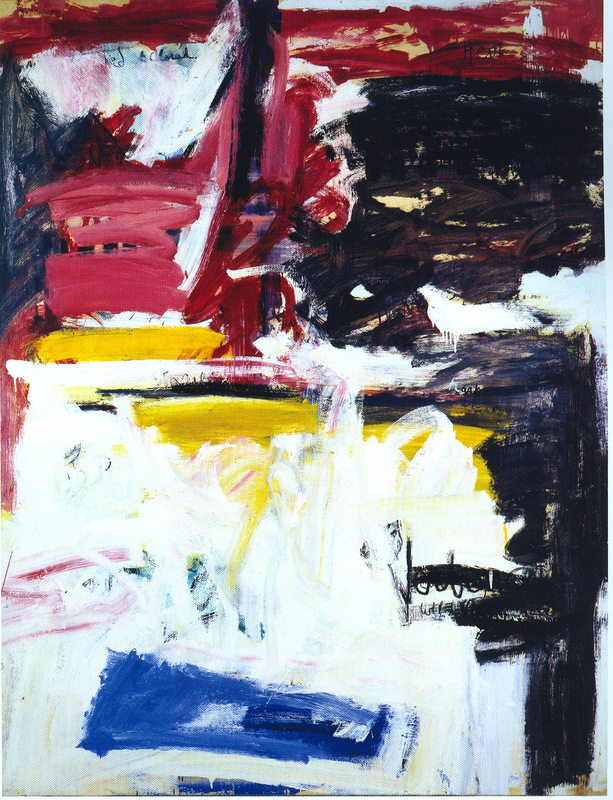 Abbott must have been of the “second” generation ab exs, later in the 50’s, people like Helen Frankenthaler and Joan Mitchell. Also Lee Krasner (I think that’s the name) who nursed Pollock for so many years. Can you do some comparisons between Abbott and Mitchell? These two seem closely related, although maybe early Frankenthaler too — it’s been a while since I looked at that. 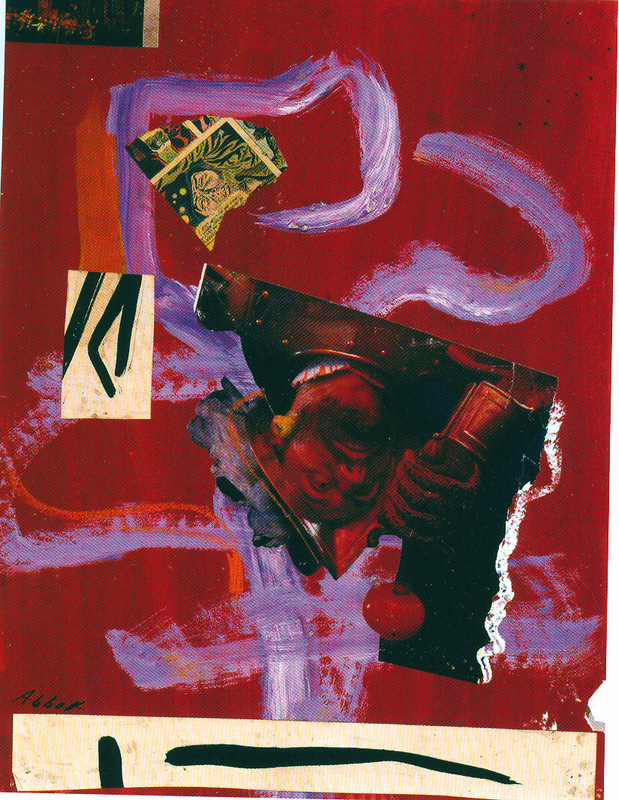 And I don’t know Krasner’s work — is it in a similar vein? Thank you so much for the introduction to this fascinating artist about whom I had no idea.